Multiple outlets are reporting that the officer who arrested Meek in 2007 was in a secret document compiled by the Philadelphia District Attorney’s Office that listed cops suspected of racial bias, brutality or abuse, and lying in court. The district attorney put together the list to make authorities aware of which cops to keep off the stand in court. The Philadelphia Inquirer was the first to report on the existence of the list, which was compiled under former DA Seth Williams. He is currently in jail, serving a corruption sentence. 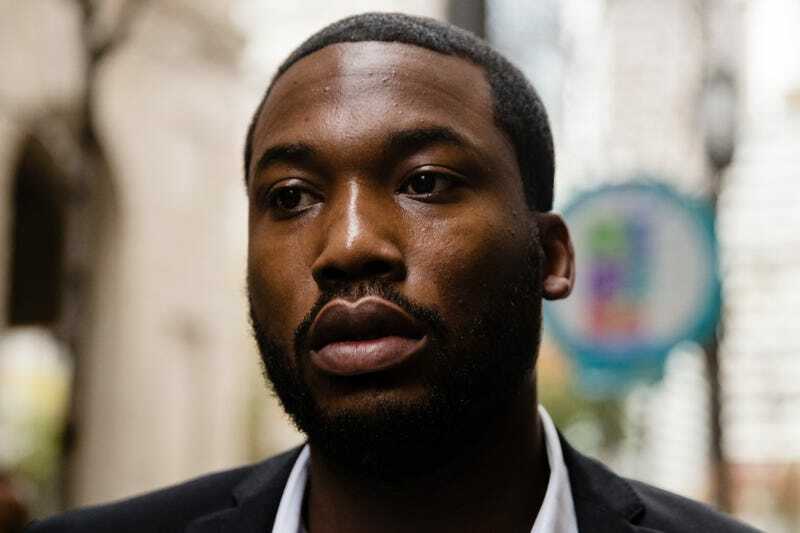 Meek’s lawyers believe that this is enough grounds to overturn the rapper’s initial conviction on gun and drug charges, which was largely based on the account of Officer Reginald V. Graham, the arresting officer who appeared on the DA list. Graham testified against Meek in court, saying that police informants saw Meek, who was 18 at the time, selling crack cocaine on the streets. Meek, however, says that at the time informants supposedly saw him selling drugs, he was actually in court supporting his cousin—a fact his lawyers say is easily provable and wasn’t even considered. The rapper also says that he was brutally beaten by four officers upon his arrest. In a 2015 interview with Billboard magazine, Meek shared a mug shot of himself: His left eye is swollen and his face is bandaged. “[I had] a concussion, stitches, braids ripped out. My blood was on the ceiling, on the floor,” Meek told the magazine. Meek landed back in jail in 2017—nearly a decade after his conviction—in a bizarre turn of events, after allegedly violating his probation by getting into an altercation and then popping a wheelie in New York City. Judge Genece Brinkley sentenced Meek to jail for two to four years—even though prosecutors did not recommend jail time. In light of the revelations, Meek’s lawyers say they will immediately file a motion in Pennsylvania Supreme Court to set aside Meek’s conviction. They will also ask the court to immediately grant him bail.